Looking for a multifunction color laser jet printer for your home or small office? The HP LaserJet Pro 200 may put an end to your search. The printer features include wireless capability, touch screen access to business apps, as well as the ability to scan, fax, and copy. This is an AirPrint capable printer enabling printing from Apple iOS devices. The HP ePrint feature allows printing from any web connection by sending an email to the printer’s email address. This 4-in-1 (scan/print/fax/copy) printer is network ready with USB 2.0, Ethernet 10/100Base-TX, and WiFi 802.11 b/g/n connectivity. It prints 14 pages per minute in black and color on up to legal size (8.5″ x 14″) paper with resolution up to 600 x 600 dpi. The printer is a work horse, capable of handling a 30,000 page monthly duty cycle with a 150-sheet input tray, a 125-sheet output bin, and a 35-sheet automatic document feeder. The fax maximum speed is 33.6 kbps. Energy savings is accomplished via auto-on/auto-off technology. Setup via HP’s step-by-step wizard was simple. Network connectivity through ethernet or wireless can be configured via the 3.5″ touch screen display. The built-in USB allows printer connectivity to a single computer or USB flash drive. Mobile access via AirPrint allows wireless printing of documents and images directly from iPad, iPhone, and iPod Touch devices using AirPrint applications. 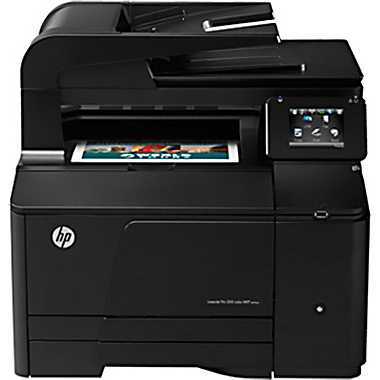 Creating an hpeprint.com email account enables printing to the HP Laserjet Pro 200 via email from anywhere in the world. Scanning features include scan to e-mail, network, or folder. Web services in the form of business apps are enabled via the hpeprint account or the touch screen. The ability to scan receipts or business cards to be stored and printed are a few of the more useful apps available. The HP Laserjet Pro 200 has excellent laser print quality. The setup and installation was extremely simple, as is evident in the minimal instruction material and effective use of the touch screen display. The only issue I had with installation and setup was the hefty weight, 52 lb., of the printer. This feature laden printer’s only negative is the lack of duplex printing. In my opinion, the inability to print double-sided is a huge negative. All my requirements for a great printer would have been checked if duplex had been included. 3 Geeky Ladies Podcast – Macworld Expo Day 1 in San Fran!